Happy Wednesday! One more week, and my youngest will be graduating, now if I can just find the time to get those invites done! It's no secret, I just *love* doing the Warhol Technique with my stamps. I thought the Get Well Teddy from Kitchen Sink Stamps would be perfect with this technique. I used my color wheel to find 3 coordinating colors of ink, I used Riding Hood Red, Pumpkin Pie and Chocolate Chip. 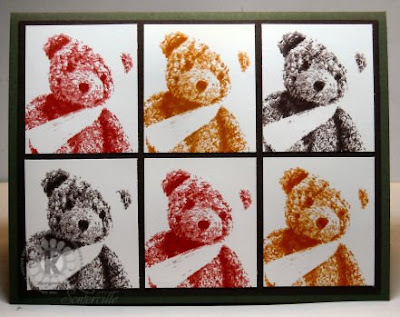 Normally when you see me do this Technique, I'm stamping in Black on colored card stock, so I thought I'd change it up a bit, besides these bears look so cute in color. To create the bear so that he would be in the proper place on all pieces of card stock I used my SAMJ, and stamped using image Stamp #2 stamping off first, in Pumpkin, cleaned the stamp, and repeated on another piece of White card stock with Riding Hood Red, cleaned stamp and stamped on another piece of White card stock with Chocolate Chip. Repeat with Stamps #3 and #4, but do not stamp off before stamping. (For this particular card, I omitted Stamp #1). Don't you just want to pluck him off the card stock and cuddle with him! I'm sure he'd bring a smile to anyone who wasn't feeling well. Don't forget, you can save 10% on all your purchases at Kitchen Sink Stamps when you use code LISA10KSS. Next week KSS is participating in Stamp Out Alzheimer's Week - to sign up click the SOA Widget on my sidebar. Thanks in advance for your support! What a way cool card, Lisa! Teddy looks great in the Warhol technique. Oooh , I love that card , so cool !! This is amazing, Lisa! I just love it!! What a fun technique too! Will have to give it a try! OMGosh, this is too cool! Teddy Warhol looks fabulous!